Airport Caddy for passenger transport and airport assistance: it's a full electric vehicle allowed to run indoor and outdoor with zero pollution and a powerful 14kW peak silent electric motor. Airport caddies can easily be found in the biggest airports and are used by airport personnel to shorten the long airport distances. 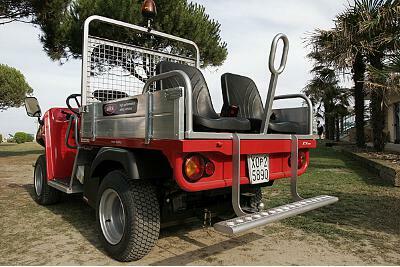 Those caddies are also used as assistance vehicles for special customers and powerful airport towing vehicles for luggage delivery. 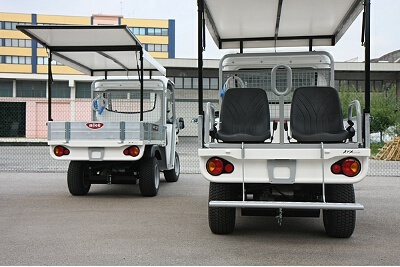 The airport electric caddy has 2 front seats and 2 passenger seats on a removable module with two independent seats, footboard and seatbelts (only airport private areas, no road homologation for the passenger module yet). 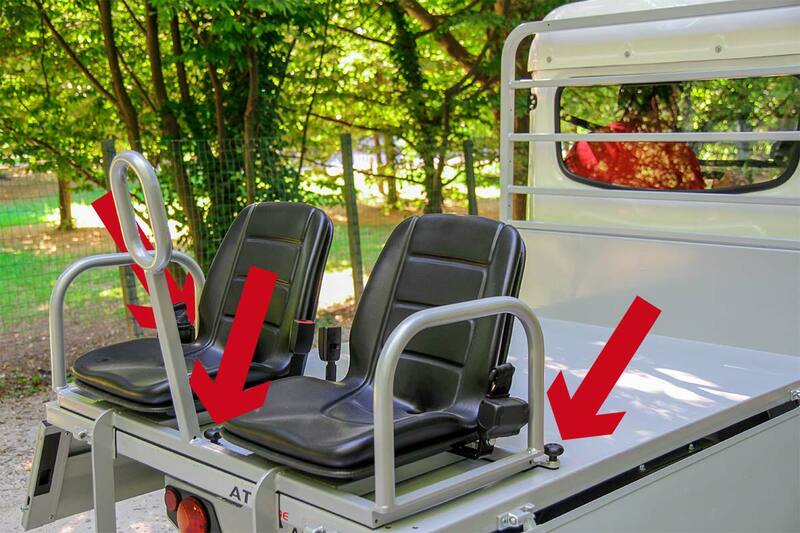 The two passenger seats on the back are mounted on a custom module that allows the passengers to easily sit and dismount from the rear loading bed of the electric caddy. 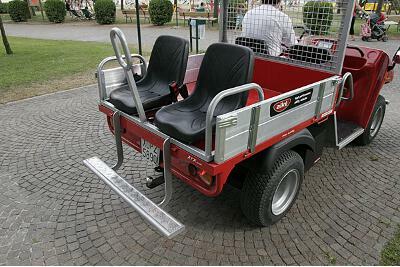 This airport caddy also has plenty of space for luggage and service equipment, the loading bed sides are fully movable and removable. 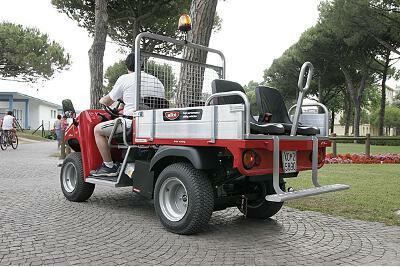 The tyres of the airport caddy can be chosen among slick tyres that are the perfect tires for airport indoors and covered walks, and outside tyres (like the ones you see in the picture above) that can be used on all terrains. 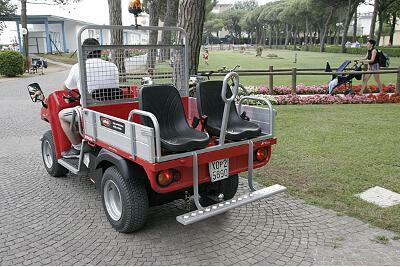 The powerful electric motor has a unique 14 kW peak and can easily allow frequent up and downs and towing jobs with a moderate impact on the luggage cart's battery life. The range of this airport caddy is one of the best around: 100Km with single charge standard battery packs and up to 130km of long range with special battery packs. The battery autonomy is further extended with the regenerative brake system that recharges the battery at each push of the brake pedal. 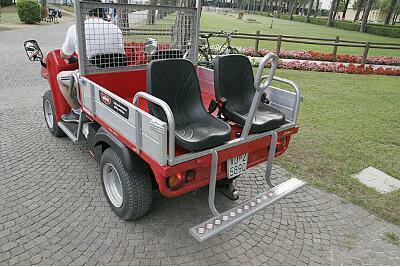 This Airport people mover allows the transportation of up to four persons – two in front, two behind – in private areas while using the zero emission electric vehicles. 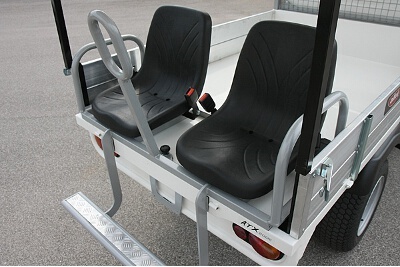 This passenger module can be fitted to the airport full electric caddy in 2 minutes thanks to a fast hook-up, and therefore transform the back loading bed.